Protecting your camera equipment during transport, the ACS Photo Pack Pro is Jack Wolfskin's daypack for ambitious outdoor photographers. The design of the compartments is sophisticated, so that you can focus on your subject when out and about. The main compartment has two sections: The roomy camera section is fully padded and offers space for the camera, lenses and flash. Personal items can be packed in a separate section. A zip lets you access the cleverly designed base compartment from the outside. With the pack on one shoulder, switching lenses is fast and practical. 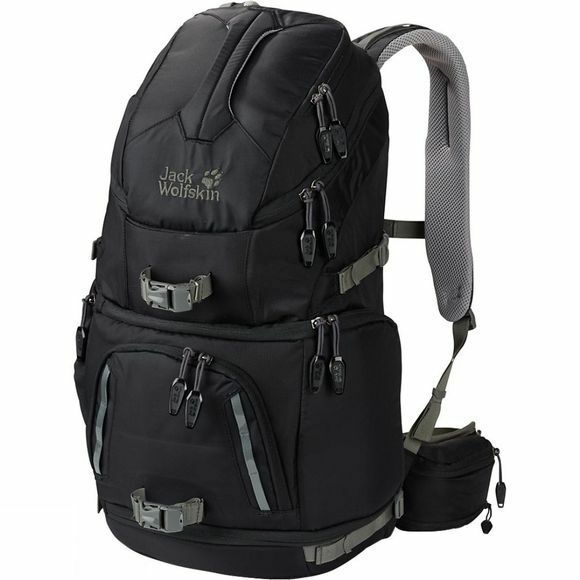 Jack Wolfskin have equipped the pack with a padded, detachable, 14-inch laptop compartment, transparent pouches for memory cards and attachments to secure your tripod and camera. The flexible suspension system ventilates your back and ensures good freedom of movement.